I’ve been part of many discussions about how Anti Squat (later AS) effects the suspension. I’ve noticed that it’s not an simple way to explain this but I’ll try. Anti Squat is a term for suspension engineers to determine how much the suspension mechanism itself is resisting suspension compression. Anti-squat is suspension’s mechanical resistance to compression due to forces from the engine (on bicycle the engine is human). Over 100% of anti-squat (AS) means suspension will extend under acceleration. With 100% AS suspension won’t neither extend nor compress. Under 100% AS means tendency to compress under acceleration. It is determined based on actual linkage instant center (IC, pivot point is also used), chain force line and center of mass height. Over 100% of anti-squat (AS) means suspension will extend under acceleration. What we’ve learned from our testing is that, if the AS is more than 100% it needs more effort to pedal uphill since the pedaling effect wants to lift rider weight. Also the suspension is harder to tune for downhill riding because of the extending forces of the AS. Under 100% AS means tendency to compress under acceleration. We’ve learned that if the bike has less than 100% AS it’s easier to control the forces with shock tuning. With 100% AS suspension won’t neither extend nor compress. 100% of AS is impossible to maintain. The bike can have 100% AS in one point of travel but it can not maintain it. Pedal-Kickback means the result of chain growth rotating the cranks backwards during suspension compress. Pedal-Kickback effect is a byproduct of anti-squat characteristics of the suspension. When bicycle is designed to use AS the swing arm is on a different axle than the cranks. The chain is connected between the chainring and the cassette. When the suspension compresses, chain needs to “grow” or give out from either end of the chain. I’m only talking about the top part of the chain. The lower part of the chain is another case. We need to add one more thing to this equation. When you travel in speed you most likely brake every now and then. The braking also effects to the suspension. It either compresses or extends the suspension. When you hit those braking bumps on the trail and hit the brakes at the same time the suspension is not as effective it could be. When the rear wheel can not move the pedals need to move. This gives again pedal kickback and when the rider stands on the pedals it makes the damping harder. The braking is also generating either squat or rise. If the bike tends to rise and the bike has a lot of AS it’s generally called brake jack. With all these together the suspension becomes super hard. Anti Squat is a good way to make the pedaling feel firm but all the results should be measured with a stopwatch rather than bragging about the perfect concept. We’ve learned that even the bike dynamics looks good on paper it doesn’t necessary perform on the trail. There is many other factors which effect the bicycle performance than AS. Geometry, derailleur, overall chain growth, rider style, tires, frame stiffness, leverage ratio, travel, shock type and aerodynamics. All this together makes the bike but the most important thing is the rider. We can make a bicycle which is easy to ride but we can not make the rider change their way of riding. The AS is good and bad at the same time but if we can control it’s effects reasonable it can be good. Modern bicycles are very effective but still Aron Gwin won in Leogang chainless = without AS and pedaling. 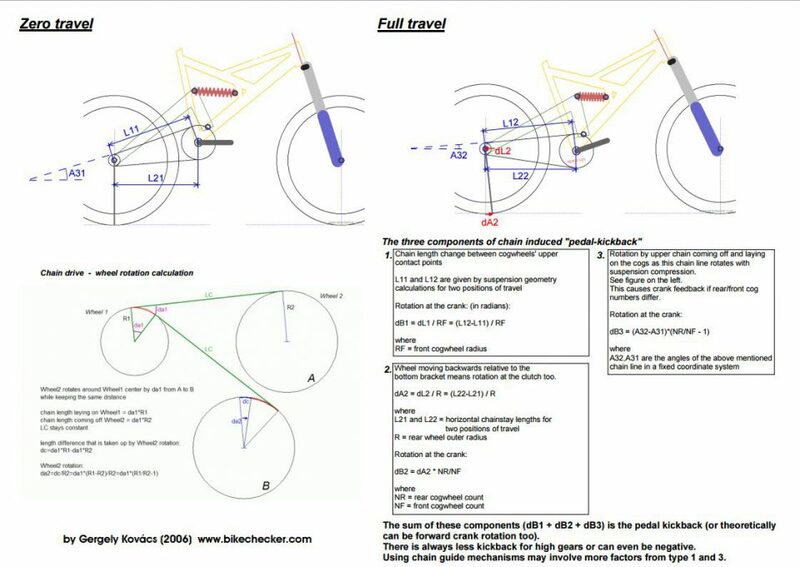 We can build a bike which suspension starts from 100% of AS and when the bike compresses the AS will drop to zero through the travel and has minimum amount of total chain growth. Also it should have under 100% of anti rise. The leverage ratio should be progressive since the AS will resist at the beginning but when the bike goes through the travel the resistance fades out and the leverage ratio is lower. Low AS at the end of the travel is also good for the frame as it doesn’t have to be super stiff. Our insight is that if the bike has stiff rear axle and front triangle but can flex from the middle it handles easier. To fine tune this system I will use an air shock which air volume can be fine tuned to suit the riders preference. We’ve already made a prototype of this bike and we are fine tuning it at the moment. There will be five bikes with the same suspension layout. Leo Kokkonen riding corners with the new Pole Evolution Concept. We have learned that long bike with generous reach is easy to ride fast. Short bike needs more skill to keep it balanced. With slack head angle it’s possible to ride corners like a pro. Longer chainstay keeps the long front centre balanced and keeps the bike stable in high speed. Long bike is not hard to turn. It just needs a new timing. Antti Lampén racing at Laajavuori.